Dimensions: 7.3 "x 1.3" x 1.3"
HM Digital HMDPH200 meters come factory calibrated and are ready to use. They are designed to stay consistent. However, after prolonged usage, it may help to recalibrate your meter using a commercial standard NaCl-based solution, which is approximately, 0.5 µS of conductivity. Immerse the meter into the calibration solution. 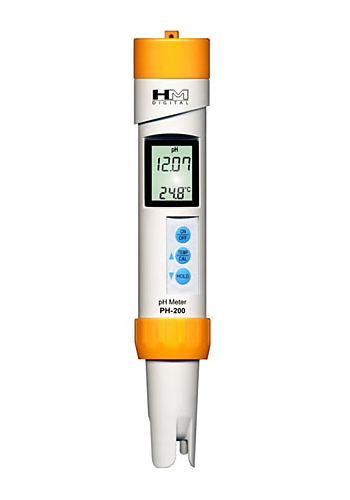 If the meter does not read within 2% of the calibration solution, adjust the reading by inserting a mini screwdriver (not included) into the trimmer pot (the hole on the back of the meter). Turn the trimmer clockwise to increase the reading and counterclockwise to decrease the reading. Note that the adjuster is very sensitive. 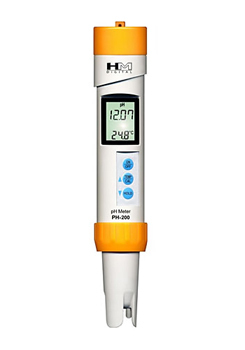 Calibration:The PH-200 meter is three-point factory calibrated to 4, 7, and 10 pH. The meter can be recalibrated with digital calibration using the push buttons, rather than a screwdriver.